The clergy of the Archeparchy of Winnipeg, from across the province of Manitoba, have gathered for their annual spiritual retreat. Every year, our Metropolitan Lawrence Huculak, together with all the Priests and Deacons travel to a quiet location for some four to five days of prayer and renewal under the direction of an invited speaker. 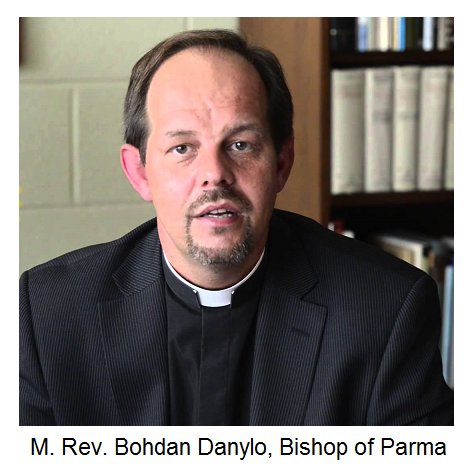 This year the director, or “retreat master”, is the young Bishop of Parma, Ohio, Most Reverend Bohdan Danylo. In his talks and homilies, aside from offering the wisdom of the Church Fathers and some contemporary Catholic writers, Bishop Bohdan has been sharing his own pastoral experiences and insights. Bishop Bohdan, before his appointment to the hierarchy, served in a number of pastoral and administrative positions. He was especially known for his years as the seminary rector of the Eparchy of Stamford and formation director for those exploring a religious vocation and/or preparing for priestly ministry. Throughout the retreat, the clergy pray together parts of the Chasoslov (Horologion), Molebens and, of course, the Eucharistic Divine Liturgy. Meals are taken together and a number of talks are given throughout the day by Bishop Bohdan. There is some time available for the participants to go out for a walk or rest. There is also some social time set aside where these ‘brothers in ministry’ - whose pastoral responsibilities sometimes don't leave them that much opportunity to see each other - can get together to share fellowship and encouragement.